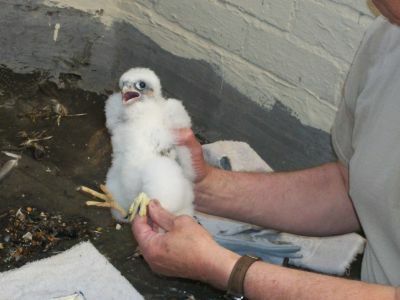 The Kalamazoo Peregrine falcon chicks got their leg bands today! It was quite an exciting morning for the chicks, their parents, and the banders. The healthy chicks, two males and one female, were banded by Michigan Department of Natural Resource Biologists Nik Kalejs and Mark Mills. The bands, one on each leg, have numbers and letters, so the birds can be identified with a good high magnification camera or if they are found grounded. The bands provide a means to track where and when each bird was hatched and its lineage and will inform biologists about the direction and distance a bird may travel to establish a new territory as an adult. Because of the band numbers, we know that Promise, one of our birds from 2014 sired a family last year in Detroit. We have not had any reports on other youngsters from Kalamazoo, but it will be interesting to learn when one of our birds is spotted. Rebecca and Kewpee were not as impressed with the science and importance of banding as the humans involved. The parent birds were very active in defending their nest and chicks from the evil biologists. There were many ruffled feathers and strong language (from the birds, not the humans), and one glancing blow to a hard hat. But, overall, it was a very successful operation and the chicks were returned to the nest with an incensed mother and a clean camera lens. Look quickly at the clean view of the nest because the chicks have already managed to get a small blur on the lens! It looked perfect for about an hour! The chicks are still pretty much puff balls but are just starting to get some wing and tail feathers. They will start to get curious and explore out of the box soon – a phase that is nerve wracking for all falcon fans. In a couple more weeks we can anticipate fledging.